The heat column is a hollow cylinder with a wick structure bonded to the interior surface. The evaporator section is the base of the column, and the walls and head of the column are the condenser section. Heat columns are paired with radial heat sinks that are attached to the heat column, providing a large surface area to dissipate the heat. However, great care must be taken to ensure that the column base is flat enough to provide a good thermal interface with the heat source. Heat columns excel in high-power single heat source applications, since the heat spreads from the small evaporator section at the base to a very wide condenser section at the walls and cap. Heat columns are seen in L.E.D. and PC CPU thermal modules, and other industrial thermal management applications. 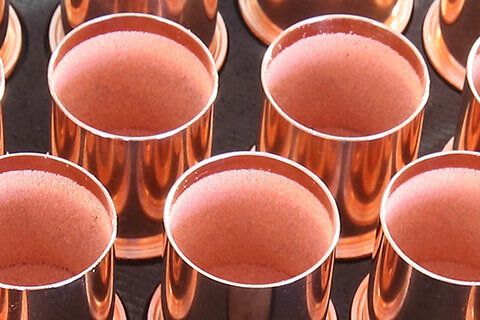 Novark uses copper pipe with a sintered copper powder wick to construct its heat column products. Due to the highly customizable nature of heat column design, please contact Novark for a custom design that fits your thermal management needs. The table below is a representation of Novark&apos;s manufacturing capability. Sintered wicks are made of half-melted metal powder that is bonded to the heat pipe walls, leaving a porous structure. This is the most common type of wick, with excellent thermal conductivity.